With the arrival of a large number of Russian immigrants after World War II, an interest in community life was renewed. In 1952 a group of new and longtime immigrants formed a club and, one year later, acquired a temporary hall which served as the Russian Community Center for six years. 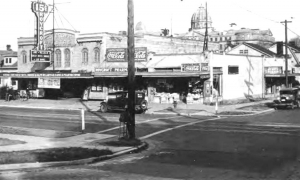 In 1959 the club obtained the former Roycroft Theater on Seattle’s Capitol Hill. The interior was remodeled from a motion picture theater into a ballroom/auditorium with a theater stage. The Center opened to the public on October 29, 1960. 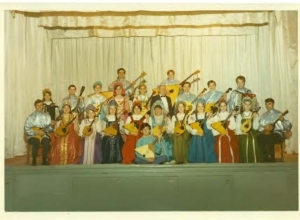 Two Balalaika Orchestras were formed at the Russian Community Center as well as a theatrical group which staged countless productions, enhancing the cultural life of the community. 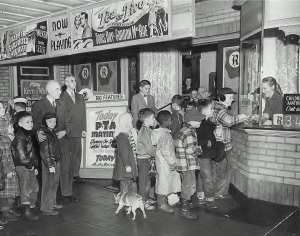 In past years, the RCC has been home to a chess club, Russian art gallery, and puppet theater. Promoting Russian Culture has always been of primary importance to the RCC. Over the years the Executive Board and Ladies’ Auxiliary have organized innumerable social events: concerts by local and visiting performing artists; annual crafts and food bazaars; spring, autumn, and New Year’s balls; and children’s talent shows. Seattle’s Roycroft Theater was acquired by the Russian community in 1958. 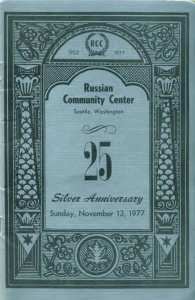 The Russian Community Center celebrated its 25th Anniversary with a gala dinner, concert, and ball on November 13, 1977. An official program, prepared under the auspices of RCC President Boris K. Holm, described the early history of the club. On September 7, 2003, a festive dinner, concert, and anniversary ball commemorated the 50th Anniversary of the Russian Community Center. The official program included an update to the club’s history, highlighting events from its second 25 years. As we move into the 21st century, the Russian Community Center continues to fulfill its mission to preserve and promote Russian culture, while maintaining and upgrading its fine, vintage facility for the entire community. Russian emigres, wherever they may have settled in the Free World, first of all established a place where they could worship God. Next, of course, came a place where they could gather socially as a community. This was just as important as the Church: a place where Russian culture and language could flourish and be passed on to future generations. The community also would extend a helping hand to those who were less fortunate than themselves. An example of the preceding is the Russian community in Seattle. Two parishes were formed, and they built two cathedrals which are the focal point of our religious community. With the arrival of a large number of Russian immigrants after World War II, a great renewed community life materialized. A great amount of resources were needed to be obtained for those people who were left behind in other countries and placed into unnecessary poverty and hardship. Producing theatrical events and other enterprising events to help this cause created a tremendous amount of expenses: foremost was renting other facilities in which these events could take place. Thanks to a small energetic nucleus of Russians, both newly settled and old-timers, a goal was set to establish a Russian Center; and in 1952 this small group took the initiative to form the base of which the present RCC is a product of. Initially a starting point was needed and a temporary committee was formed whose first president was the late George I. Sheeper. Not having any material means to start out with, the initial meetings were held in the living room of one of the board members, Joe Slootsky. Finally, with the Lord’s help, in June of 1953 the RCC acquired its first tangible asset – a building. It was purchased for $9500 with a down payment of $3000. On August 30th of that year, a moleben blessing the building was officiated by the Very Reverend Paul Jeromsky. The RCC, by that time, had already been incorporated with a set of by-laws, but many consider that day as the day the RCC began. It could have been because of the joyful atmosphere that had engulfed the over 200 people, including then Mayor Pomeroy, who were in attendance. The President of the RCC, Elly I. Sheeper, said to those present that the building was a temporary one, and that it was necessary to start working to find a larger building with a hall and stage so that we would be able to hold our own events. 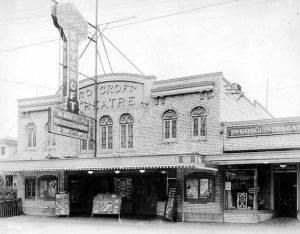 Five years later, under the administration headed by George G. Kalfov, the center acquired the former Roycroft Theater which is now housing the RCC. When the RCC took the old Roycroft into possession in February of 1959 it was in terrible shape. It needed an incredible amount of work to make it into something worthwhile. Thanks to a high spirit and all-around friendship, everyone pitched in to help in the remodeling effort. Elly I. Sheeper, a contractor by profession, agreed to take charge, and he organized the work forces. While the men, both young and old, were working, the Ladies’ Auxiliary had the job of feeding the work force. With the Lord’s help we always had the supplies we needed, even if sometimes they were hard in coming. The overall remodeling and design was under a committee made up of Elly I. Sheeper, Valentina A. Booriak (Nejin), and George A. Grant. The kitchen facilities were designed according to the Ladies’ requests. The theater floor was leveled, and a hardwood floor placed on it. New ceilings everywhere along with a fresh coat of paint both indoors and out were part of the final plan. In 1959, during the remodeling, his Eminence Archbishop John (Maximovich), while visiting Seattle, blessed the newly remodeled building. A combined choir, as seven years earlier, under the direction of the late Cyril N. Andreev sang at the moleben. Upon the completion of the remodeling in 1960, a thanksgiving moleben, officiated by the Very Reverend Paul Jeromsky, started the opening ceremonies of our new center. In attendance at this festivity were the presidents of other Russian centers: G.K. Bologoff, San Francisco; N.N. Stromiloff, Vancouver, B.C. ; Seattle Mayor Gordon Clinton; and others too many to be mentioned here. It should also be noted that there were in excess of 700 people in attendance. A theatrical production group was one of the first fund-raising efforts of the RCC. Beyond being an accomplished actor, the tireless and energetic Nicholas V. Yanovsky as director staged countless productions that enhanced our community both culturally as well as financially. Within the RCC two balalaika orchestras were formed. One was the children’s orchestra under the direction of Serge V. Lusgins. This orchestra still exists today under the baton of Alan Toelle. The other orchestra was founded in June of 1958 under the direction of Alexander A. Borisoff. Later on, the Reverend Nicholas Sanin (then deacon) took the baton over. In September of 1953 the RCC founded the “Bulletin” which at first was called “Obozryeniye” (Review). Its first editors were Ardalion V. Volgin and Nicholas V. Yanovsky. This was the only Russian language publication in our state that kept us abreast of current news and life in the community. The last editor of the “Bulletin” was John F. Kovtunovich. Victor Mort, an established author, founded a chess club within the RCC which sponsored many tournaments in the Northwest and British Columbia. In 1966 the RCC selected Queen Ludmila Faber to represent the RCC in the annual Seattle Seafair pageant. During the past 25 years the Executive Board and the Ladies’ Auxiliary had the responsibility to organize innumerable balls and concerts. We cannot forget the late Ekaterina M. Wilson for her untiring organizational and administrative efforts which always produced first-class productions. We received a great amount of pleasure from visiting guest artists who performed at the RCC. Some of those who performed at the center were Vera Brynner, sister of actor Yul Brynner; Nina Kravtsova of San Francisco; Irene Rene of Los Angeles; Nona Mari and Michael Gann of Vancouver, B.C. ; and the renowned pianist Vladimir Pleshakoff. We cannot forget our own youthful talents who annually appear at our “Youth Concerts.” These concerts were initiated by Elsa I. Vagners and are now under the supervision of Larissa V. Bivoino. The RCC had “Yolkas” for our children during the Russian Orthodox Christmas season, and we plan to have one this coming season on January 8, 1978. The hardest and most taxing work in our organization has to be that of the Ladies’ Auxiliary. All of our work and undertakings have been completed thanks to their help. The annual “pre-Christmas Bazaar,” New Year’s, all sorts of dinners and buffets for balls and concerts are just some of the countless ways they have supported the RCC. In regards to philanthropic work, the RCC helps to support a number of charities. The RCC lets the two parishes use the facilities whenever they need, without any charge to them. Preliminary work is now under way for the founding of this “Rest Home.” It will be a place for our elderly community members to be together in the twilight of their years. We plan to include a chapel for those who will not be able to attend the Divine Liturgy in either one of our churches. Since the RCC’s inception our main concern was the unification of the Russian community for the common goal of love, friendship, respect for one another, and harmony among ourselves. A small, but important example of this occurred in November of 1966 when the combined choirs of both of our parishes under the direction of both directors — Cyril N. Andreev and Arkady A. Juskaeff performed during a sacred concert. The concert created such good feelings among those both performing and in attendance that the hall was electrified. In the future, the RCC will continue to proceed as it has in the past to strive toward this same goal — the unification of our Russian Community. If, by any chance, in writing this brief history of our Center we have omitted any important names or events, please do not pass judgment on us. It was virtually impossible to recount everything that happened to us in the past 25 years in so few pages. Eternal Memory to those hard-working people who helped make the RCC what it is and have gone to a better world. Their work will not be forgotten. A very deep heartfelt thanks to those who are continuing to work, and may the good Lord protect you and grant you many years. The Russian Community Center is a founding member of the Ethnic Heritage Council of the Pacific Northwest. The first organizational meeting was held in the small hall of the RCC. 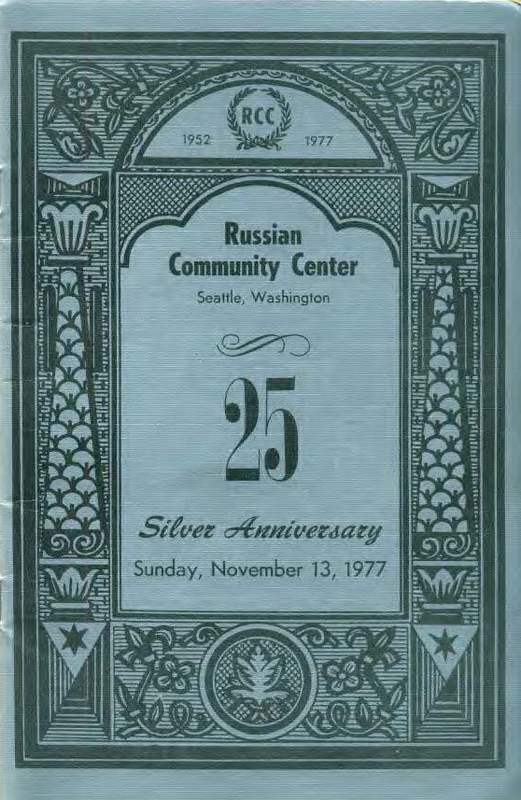 In the 1980s, the Russian Community Center provided a venue for visiting artists from the former Soviet Union who were participating in the Seattle Goodwill Games. Once again, the cultural life of the Russian Community Center has been revitalized by an influx of talented new immigrants. The Russian fold dance group, “Alenushka,” under the direction of Rena Lisikova, represents the RCC at many community functions. In June 2003 a joint effort between the Eastside Symphony and Russian Community Center resulted in the well-received production of “Aleko,”a one-act Russian opera. We anticipate many such events in the future at the RCC. The Russian Community Center continues its mission to promote and celebrate Russian culture in the community. Many people in the greater Seattle area appreciate our facilities and the fact that we are working hard to maintain and upgrade a fine, vintage building in a fast-changing city. In 2013 a new semi-sprung maple floor was leveled and laid in the small ballroom/gallery. This room is now being rented every weekday evening for dance classes and small community events. In 2015 a bright and lively new carpet in the front lobby and upstairs now invites members and guests into our main ballroom which was expertly refinished to its golden glory. We also revived an old club tradition: the Day of Russian Culture, celebrating talented young people from our community. On an ongoing basis many Russian groups use our facilities, including the St. John’s School Dancers, Alenushka Dancers, Chameleon Theater, Russian Children’s Puppet Theater, and the Ivan-da-Mar’ya Dance Group. At Christmastime we host up to six Yolka parties for over 1,000 children. In 2015 a Russian school to teach children juggling, acrobatics, and bayan (button accordion) was opened by Sergei Krutikov, a renowned performer in his own right. The Roycroft Theater opened in 1925 as a neighborhood theater, complete with a “Robert Morton” pipe organ. It was was owned by Lorenz Lukan (b1884-d1966), and later by John Danz, original name Danofsky, an immigrant from Bronsk, Russia (b1877-d1961). The Roycroft was one of three Capitol Hill movie houses. The others were the 900 seat Venetian (14th Ave and E Pine St, opened 1926, closed 1958, razed 1960) and The Society Theater (Broadway and E John St, opened 1909, reconfigured as the Broadway Theater in 1921, remodeled to Streamline Moderne in the 1940s, and adapted to a Rite-Aid store in 1990). 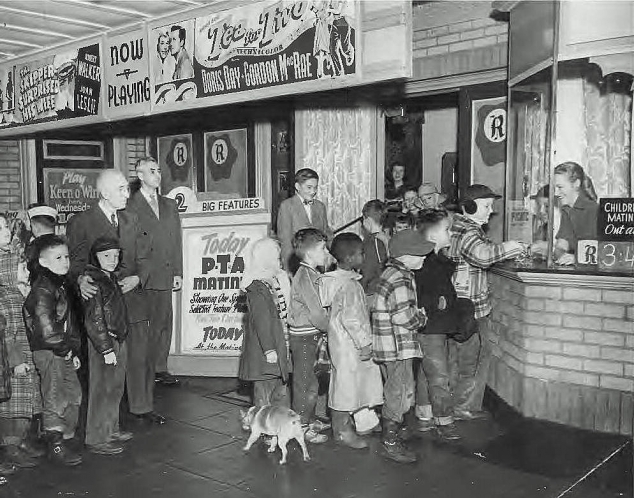 The growing popularity of television in the 1950s put many neighborhood theaters out of business. Thus too, the grand old Roycroft. In 1952, a Russian group formed a club which one year later acquired a house that served as their center. 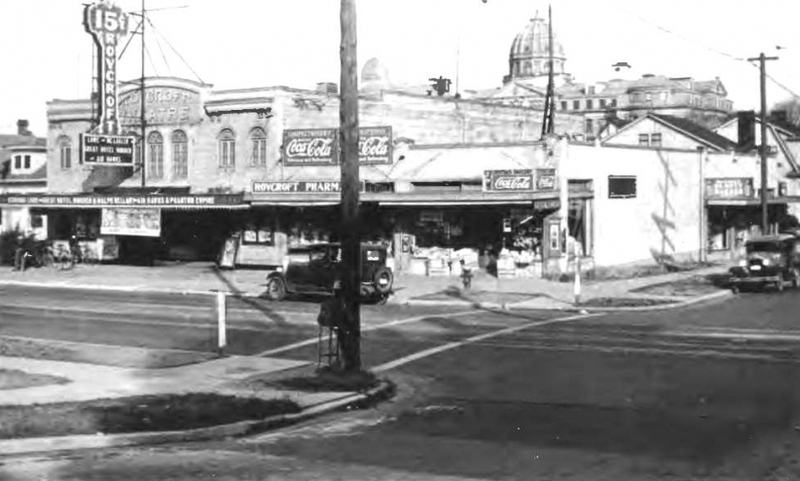 In 1959, the club acquired the Roycroft Theater and the adjoining drug store with soda fountain, radio repair shop, etc. All was converted into a ballroom/auditorium, kitchen, and rental space and reopened to the public on October 29, 1960. Phantoms of the original 1925 theater remain including the proscenium arch of the early movie stage, ticketing booth, period decor and murals, gold trimmed cornices, and stylized fleur-de-lis fusing the practicality and playfulness of the Arts & Craft era. “Roycroft” means “King’s Craft” and refers to a reformist community of craft workers and artists led by Elbert Hubbard (1856-1915) . The movement was said to have strong influence on the development of American architecture and design in the early 20th century. Asleep but not forgotten is the old theater air system. It provided silent, slow moving, subterranean tempered ventilation to movie patrons. Much of the old system including motor/squirrel cage fan/leather belt drive, heat exchanger, and ductwork have been abandoned but are still intact to view. A fresh air intake is seen in the alley wall with a plenum leading downward to a manually operated mixing chamber. Air delivery finished through the fan/heat exchanger and out into the auditorium. Coal was first used as fuel, then oil; current heating is via gas fired independent space heaters. The coved lath and plaster ceiling of the theater hides massive wood beams above running north-south from column to column. Above these beams and giving full access to the attic are open pony walls. The pony walls support an independent weather roof. Original photographs courtesy of Bonnie and Jeff Ackles. Bonnie is the daughter of the Galashins, former owners of the Roycroft Theater.